You all know that I love to paint, just about as much as I love to garage sale (maybe not quite, we all know I'm OBSESSED with sales). Anyway, since pretty much every renovation in the house costs a whole lot of money that we don't have, I have no choice but to change things up with a can of paint, my own hands and a painting ladder that I conveniently got at an estate sale for $6 (score). 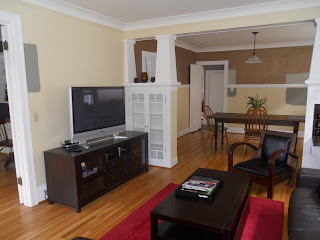 When we moved in I knew right away what colors I wanted in the den. I had the whole thing mapped out in my head and it just so happened to work out just like I planned it. Apparently that is where my inspiration ended. Once I was done making that room perfect, I kind of lost all my mojo in the decorating department. Our living room and dining room were clearly my next move because they were so BLAH- but I just couldn't figure out what I wanted. Chris was also no help on the creativity front, and so we pretty much did nothing. We actually didn't even really use these rooms. We only really use the den, cause it was so darn cozy in there. See. Cozy huh? Like that I took the photo from the stairway? Artsy huh? About a month ago we were both staring at our light yellow walls in our living/dining room and sending them dagger eyes. Our collective laziness and apathy finally got to us and we figured that maybe if we went looking at paint, we'd get inspired. So we headed to good old HD and spent about 35 mins picking paint colors. 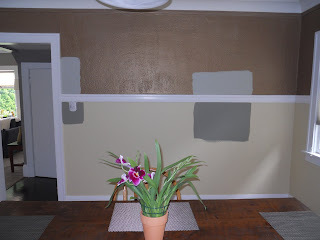 We settled on 2 shades of green and went home to try the samples on the wall. 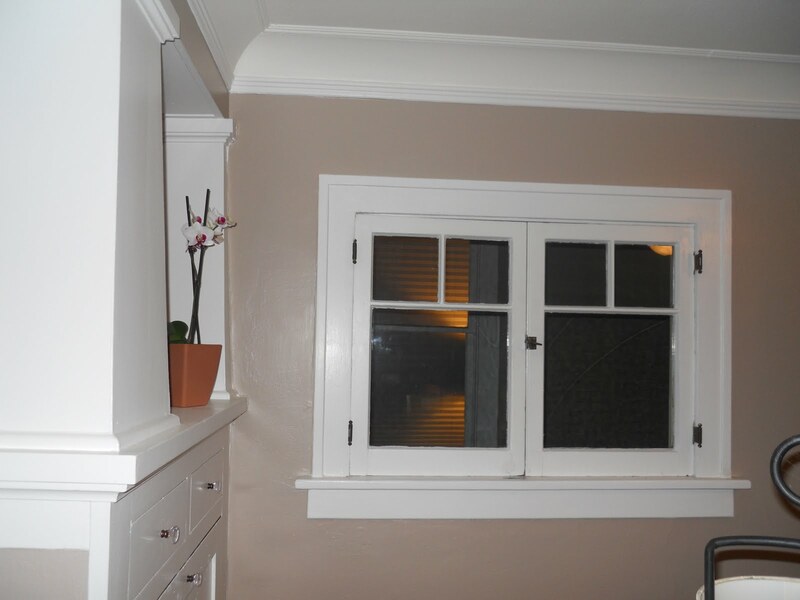 We I painted small swatches all over the walls in both rooms so I could see the paint in many different lights. To be honest I went a little crazy with the wall samples, but I figured that we would make a choice and move forward pretty fast. You think I painted enough swatches? You can't even see the ones on the wall behind me. 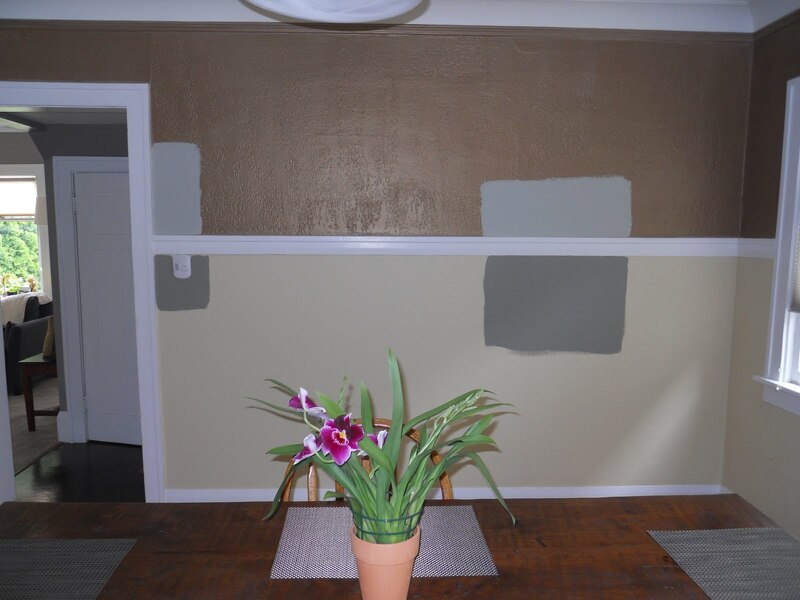 We let those paint samples sit on the wall for over a MONTH. Yes, it was ridiculous. Laziest homeowners ever. We should have placed some sort of disclaimer on our front door: "Hey guests, welcome to our house. Please, sit in our loaner chairs and stare at our weirdly painted walls- but oh look at our pretty front porch couch...."
Not even the cute couch could distract from the paint swatch nightmare that was our living/dining room. Does the cuteness of this make up for the weirdness inside? At least for the first few weeks I could say, "we're still deciding what we want." We didn't love or hate the paint, but it didn't feel quite right. Then after 4 weeks, we were just being lazy and indecisive. Well, I was being lazy and indecisive, Chris was doing very manly things in the backyard that included power tools, safety glasses and beer (none of which I'm particularly interested in). He kind of gave up on me and my painting woes and went to be productive elsewhere (more on his progress soon). My apathy and lack of productivity could it have been brought on by the horrible mixture of light yellow, bronze, sage and mint greens? Doesn't that sound a lot like the color combo of vomit?Just saying, it isn't a particularly inspiring pallet. Vomit? Do the flowers make it better? I thought so. Neither of us were dying to paint the whole room either of the colors that we picked. Plus, I think I am officially over green. Well that's a story for another time (both my craziness and my "so over it" feeling about green). Anyway, what I decided is that we really need to warm up and lighten up our living room space, it was feeling too dark and heavy. I think I was having a hard time picking a color because all of the furniture in the living room was wrong. 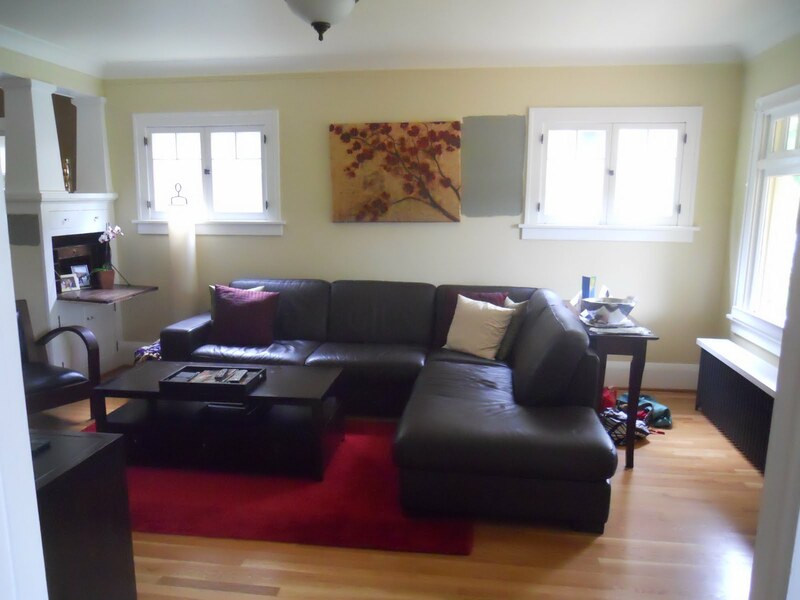 We transplanted our extra large dark brown leather sectional, our large deep red rug and our large and heavy dark brown wood coffee table and TV stand when we moved in to the house. All of these pieces were our furniture from the condo, and we knew the living room wouldn't be their forever home. They all worked great in our loft space and the scale was perfect for our huge living room with 14' ceilings. 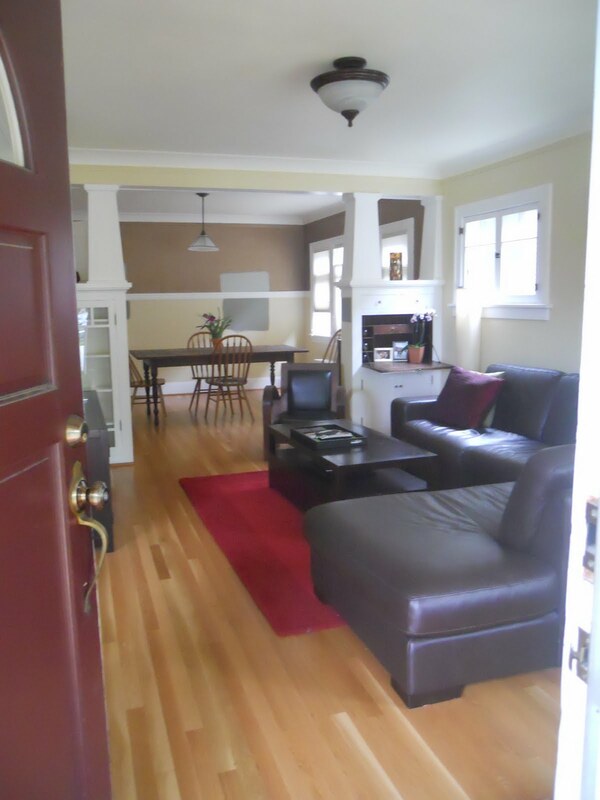 Here in our 1918 house with small rooms, they are dwarfing the place. The scale is all wrong. 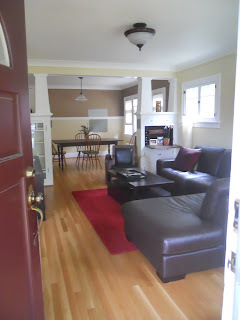 Once I decided that the living room furniture had to go, inspirations started to flood in! Even though I cringe at the thought of getting rid of all the beautiful furniture that we paid a small fortune for (back in the disposable income days), I think it has to be done. Ashley- Hey can we buy new furniture? Chris- Are you going to buy used crap from other people's houses? Chris- We can buy furniture only if it's nice and new from my favorite store Restoration hardware. Ashley- Do you know how expensive that will be? Chris- Yep, looks like we will start saving now and in 12 years you can buy new furniture. Chris- Yeah, you've done a good job so far, go for it. I was shocked and excited! Apparently he is finally on board with my designs. Hopefully he doesn't cross over to the dark side completely, because then who will tell me if I've gone crazy? Or become hoarder? Hopefully he can straddle the line. Anyway, we decided we would keep the couch in the living room, but I am going to craigslist the coffee table and TV stand. Since they are still being sold at Pottery barn I am thinking I can get a good price for them, and put that toward some new furniture. I think we have agreed to do half new furniture from real stores and half from sales. Compromise, what a lovely thing. The couch and dining room table will be the only pieces that will be staying, everything else is going to find a new home. Once I mentally got rid of all that stuff I apparently opened up all kinds of space for new ideas to flood in. Paint + Inspiration = paintspiration. 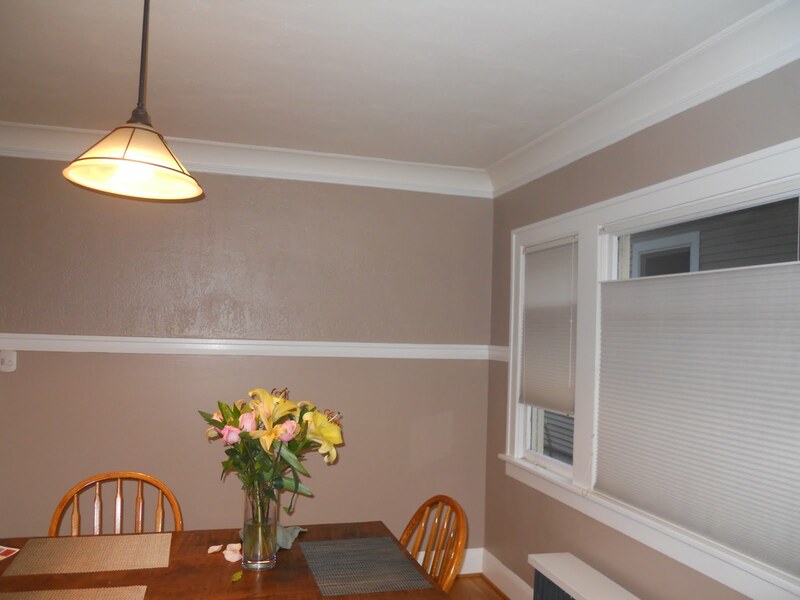 I went with a grey/beige also known in our house as greige. 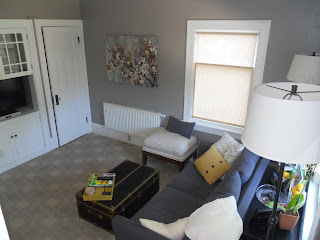 Nothing like a little "greige paintspiration" (in my mind this is like the Brangelina or Benniffer of home decor). We took a family vote (our friend Lauren is staying with us and thus is involved in family decisions) and decided all three of us liked the same color so I ran off to the store to get it (PS I cheated on Home Depot and went to our local hardware store). Three people can't be wrong! Being over excited and slightly crazy (crazy is the new normal), I painted all night and Lauren (also overly excited) volunteered her help (she's new, she will eventually run and hide with Chris when I bring out the paint). We got the majority of the two rooms done in one day. 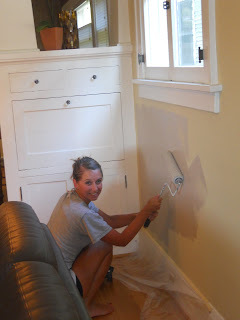 Boy, painting goes quicker when there are 2 people doing it (Chris... are you reading this? Just imaging how fast it would go with 3). Little did Lauren know she would be photographed for the blog. Anyway. When we woke up the next morning, super excited to see the color in the light of day, I was shocked when I went down and saw... purple. Do you see purple? I swear it looked purple. Lauren tried to make me feel better about it and said she really liked it (there is a high possibility that she was lying). I was really dreading having to go back and buy more paint and start again. Especially after my over-excitement made me buy 2 gallons of the greige purple. Then I did something I never do. Relaxed and stopped making snap judgements. Old dog. New tricks. Who knew? Anyway after a few days of relaxing I was actually really liking the color and I stopped seeing purple all together. Once I got the trim painted with a crisp white and the last remnants of the old light yellow and bronze were gone, I was totally jonesing on the wall color. That, my friends, is when Chris offered his 2 cents on painting. As I'm just finishing with my third trip around the room on the ladder (not fun), touching up the trim so it was perfect, he says "yeah I really think a third color would be cool," meaning he would like a wall color, a lower-crown-molding color and an upper-crown-molding color. I gave him the look. You know which one. Then I rolled my eyes. I'm sure I said something like "If you want to paint a 3rd color, go for it" which promptly ended the conversation, because we all know there is no way that was going to happen. Anyway, back to me jonesing on the wall color. I was imagining all the new furniture and the rugs and that made me like it even more. Plus Chris agreed that we could "go crazy" this weekend shopping for new home stuff (within a budget of course- I'm getting my coupons together as we speak). Anyway, the painting is finally done. 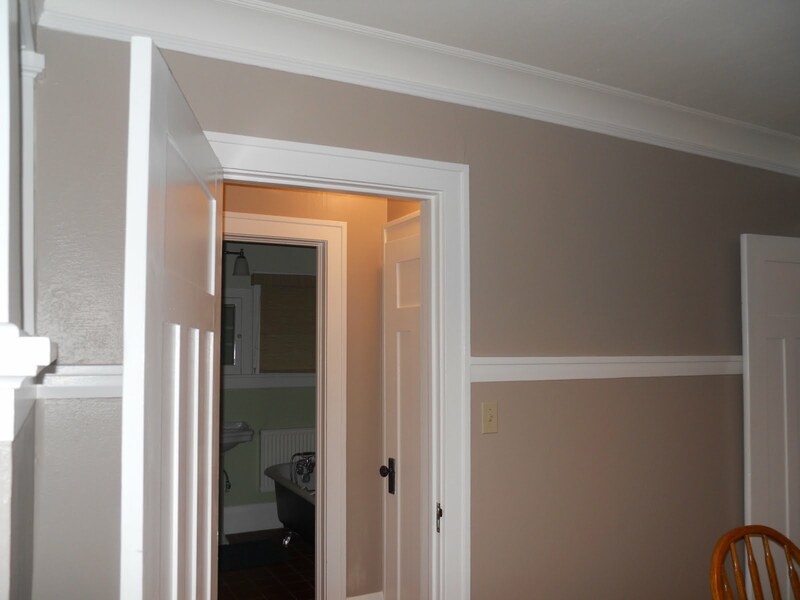 I still have a full gallon of paint that we didn't use (woops), but I am very pleased with the color. 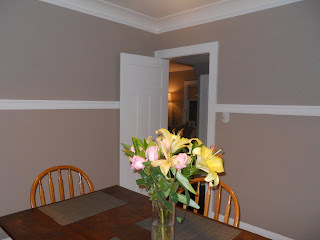 Maybe I will paint another room that color with my extra can- or better yet, maybe you need it for your house? Any greige takers? The yellow doesn't actually look bad here..... I promise, it WAS bad. This doesn't show anything beside my adorable secretary desk. Love. I already feel better in the space and I haven't even added or subtracted any furniture. We are going to do some serious shopping this weekend and hopefully get some new rugs and furniture. West Elm is seriously calling my name. Until then, I think this is a huge improvement. Agreed? Notice that the top and bottom look like 2 different colors? That was a happy accident. The yellow and bronze turned the new color slightly different tones and we love it. I didn't take any living room pictures because it was chaos of jumbled furniture, old mail, my gym bag and last Sunday's news paper. I am trying to keep up the mirage that I have a clean and organized house all the time. Is it working?